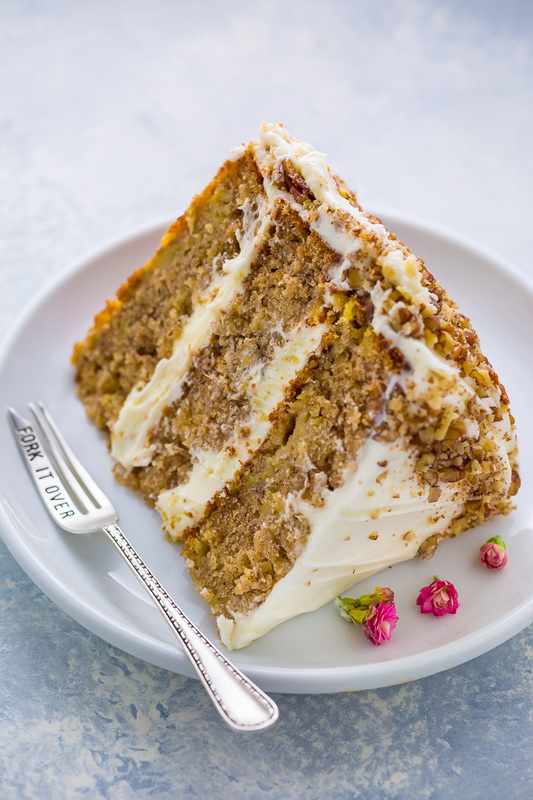 Moist and extremely flavorful, this Hummingbird Cake is pure perfection! Perfect for Easter or Mother’s Day! 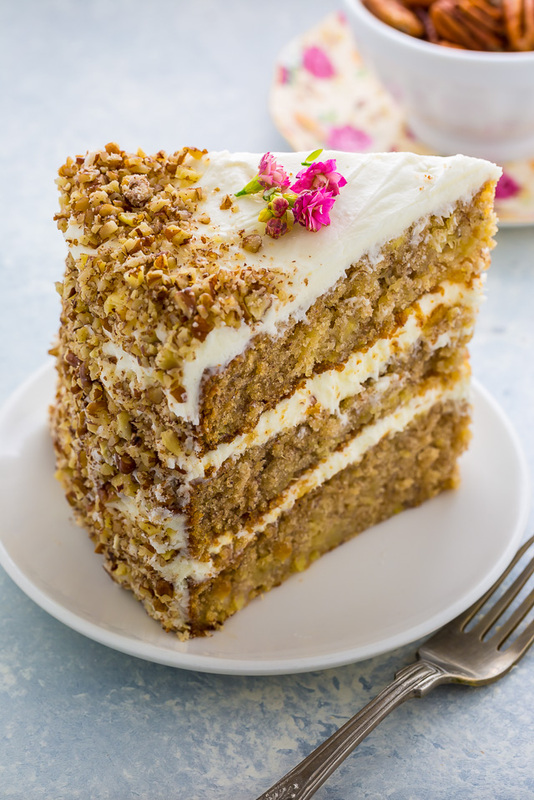 Have you ever had a slice of hummingbird cake? I ask because I find it’s not as widely known as chocolate, vanilla, or even red velvet. It has more of a cult following. Like Twin Peaks… or Office Space. But I’m here to change that! 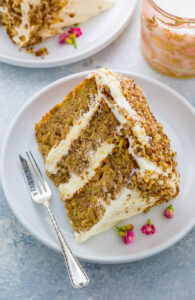 It’s high time we make this moist and luscious banana-pineapple spice cake a household name. I still vividly remember my first time trying hummingbird cake. I was vacationing in Pigeon Forge, Tennessee. What a fun little town! We rented a cabin waaaaay up in the hills, and spent most of our days exploring wild hiking trails. It was on one of those hiking expeditions that we stumbled upon the cutest little diner we’d ever seen! It was by no means fancy. It didn’t have a sign… or even seats! But what it lacked in decor it made up for in heart. We glanced over the humble paper menus with hungry eyes, and ordered enough food to feed a small army. 20 minutes later we were blessed with a feast of pulled pork, fried green tomatoes, buttery biscuits, and – you guessed it – hummingbird cake! I won’t lie, I barely noticed the cake when the trays were set in front of us. It’s not exactly a showstopper. But what it lacks in looks it more than makes up for in personality! After taking one bite I was HOOKED. “What is this?” I exclaimed in between bites. I didn’t share a single crumb that day, and we ended up ordering 2 more slices to-go. It wasn’t just dessert…. it was an experience! I’ve spent many years trying to recreate that hummingbird cake. No lie… I’ve probably made over 25 versions! Some were awful, some were fine, and some were very, very good… but none of them lived up to the memory I held. That little diner set the hummingbird cake standard high and I was determined to meet it. And last week, I finally did! Make sure your bananas are extremely ripe! The cake draws moisture, flavor, and sweetness from the ripe bananas, so the blacker the better. Don’t over bake! I baked this cake in two different ovens and found in my home oven it was done at 35 minutes, while at my friends house it took about 41 minutes. Every oven is a little different, so start checking on your cakes around 33 minutes. To ensure you reach the proper frosting consistency you’ll want to make sure your butter and cream cheese are very soft before beginning. I suggest setting them out on the counter for at least an hour before unwrapping them and getting busy; they may soften faster or slower depending on the temperature of your house. You’ll know your they’re soft enough when you can press your finger into the top and a deep indentation is effortlessly made. Cold butter and cream cheese, as well as melted butter and cream cheese, should never be used when making this frosting; it will not work. You’ll need an electric handheld mixer or a standmixer to make the frosting. 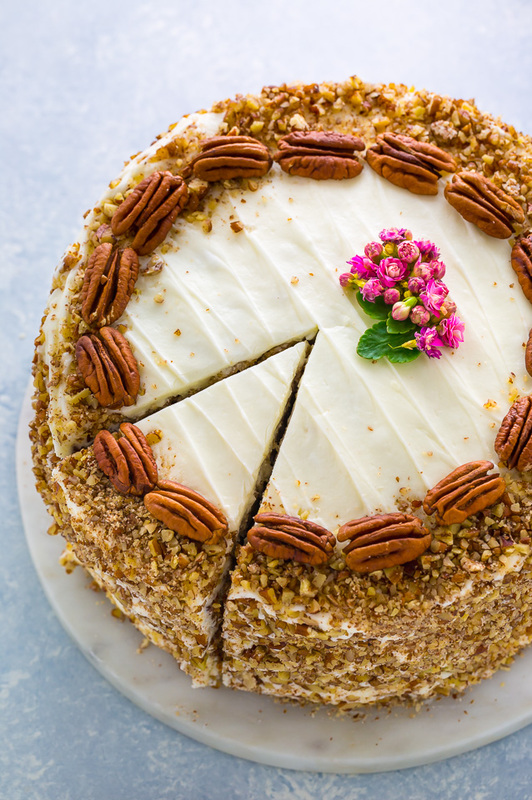 For an extra pretty presentation, try topping your hummingbird cake with extra pecans and edible flowers! If you’d like to press chopped pecans around the sides of the cake, be sure to do this right after you frost the cake. 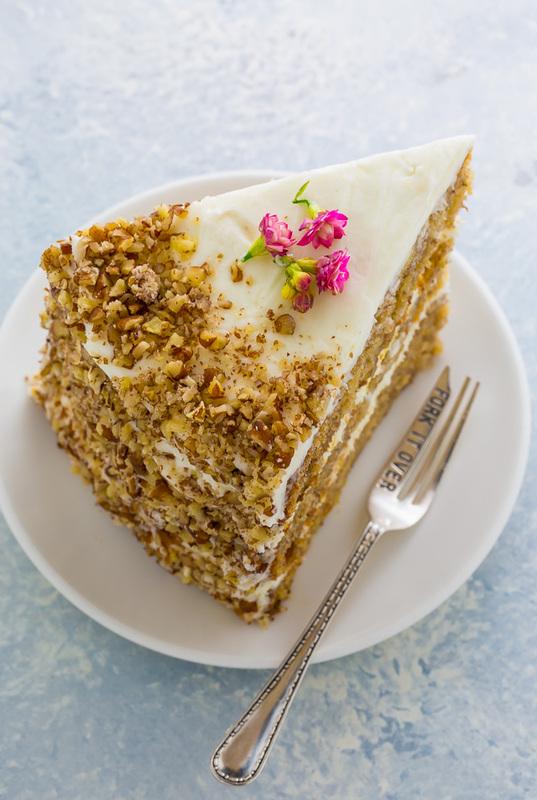 Are you ready to welcome hummingbird cake into your dessert life?! I just know you’re going to LOVE it. Especially if you have an inclination towards banana flavored desserts. Moist and flavorful Hummingbird Cake! Flavored with banana, pineapple, and rich spices! In a large bowl add the cake flour, baking soda, cinnamon, nutmeg, and salt; whisk well and set aside. 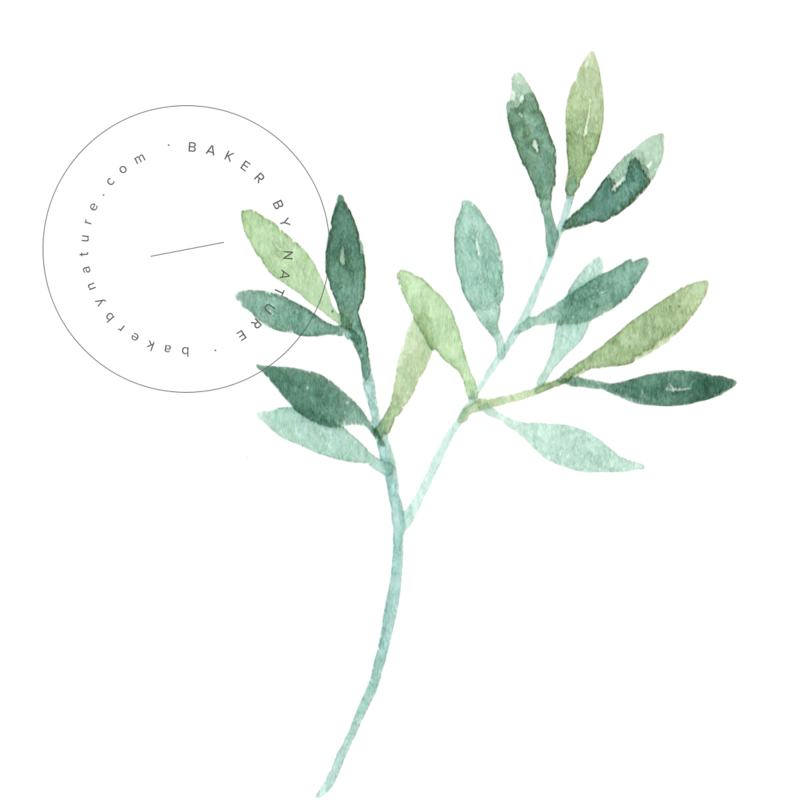 In the bowl of a stand mixer fitted with the paddle attachment, combine both sugars and oil; beat smooth, about 2 minutes. Add in the eggs, one at a time, beating well after each addition. Add in the vanilla, mashed banana puree, crushed pineapples, and pineapple juice; mix on low speed until combined. Add the flour mixture in thirds, beating on low speed until just combined. Fold in the pecans. Be sure not to over mix the batter! Divide the batter evenly among the pans and smooth the tops with a spatula. Bake for 35 to 40 minutes, or until a cake tester inserted in the center of each cake comes out clean. Cool in pans for 15 minutes, then carefully remove the cakes from the pans and place them on a cooling rack to cool completely. 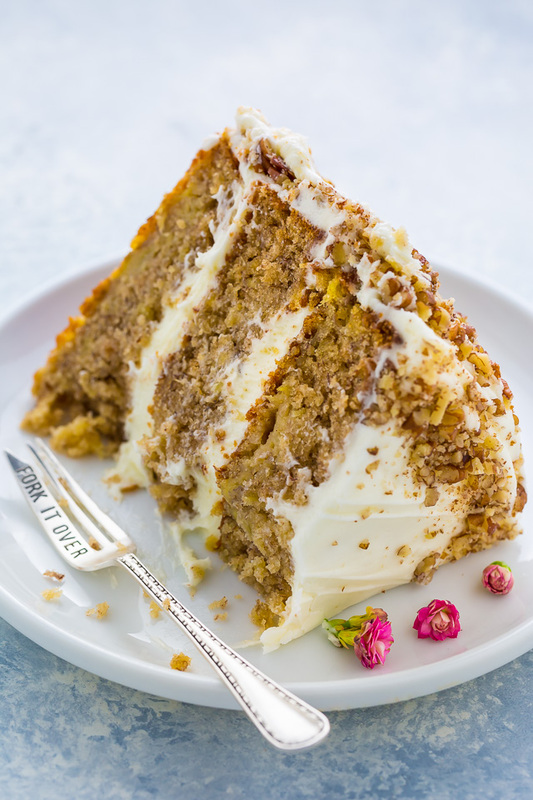 I love Hummingbird cake, and I made the original recipe couple of times, its good but very sweet to my taste, not to the husband. Your version is different and I think will take the taste to the next level. I am going to try your recipe soon and let you know… I just whipped two cinnamon raisin bread . This looks gorgeous AND delicious! Looks like I have my weekend baking adventure now! 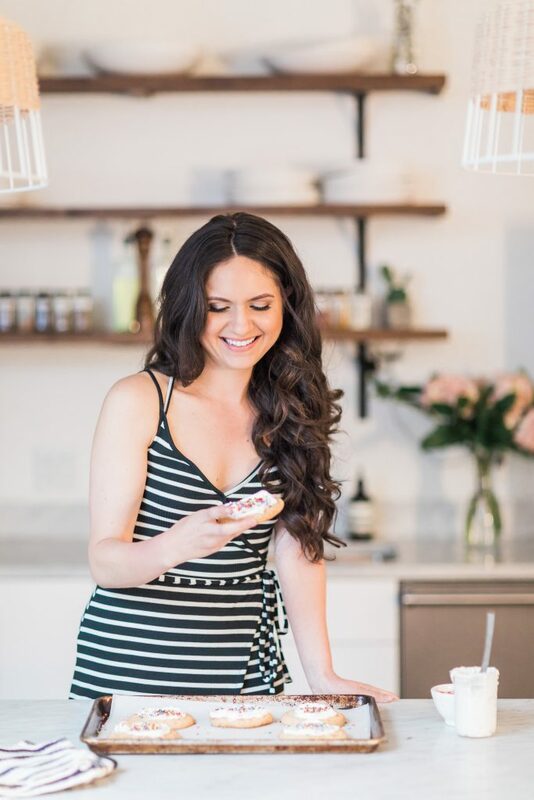 Would you consider adding a Pinterest or yummly button to your blog? I made half the recipe and also made into muffin style little cakes. I did find them a little dry but with the beautiful frosting – made up for it. Possibly I messed up the cooking time? Even half makes a lot of small cakes. Thumbs up to the actual recipe which I admit I may have spoiled somewhat. WoW! Lovely cake it is. Will be trying this yummy cake in coming weekend for party. Baking is something I love the most and I m perfect in that field. Hi Ashley! I’m looking forward to making this for Mother’s Day but was wondering if you think it will make a big difference if I leave out the pecans? A couple members of my family are allergic to tree nuts so I would want to leave them out if possible. I followed this recipe exactly, except for the decorations. I used a pecan prittle and candied pansies. The cake was delicious. If I make it again I will maybe not let the cream cheese get quite so soft because it made the layers shift a bit when I put it together. I put it in the fridge (very carefully so I wouldn’t lose a layer!) so it could firm up after. But it was so delicious! sure gonna try this soon! This cake is amazingly delicious! Best recipe by far, thanks for sharing! Made it for my friends (we live in Sweden) and they all loved it!!! Would the recipe have to be altered for high elevations ? If so, how? Thanks!